New diagnostic identifies mitochondria dysfunction in Type 2 diabetes. Impaired activation of mitochondrial energy metabolism in the presence of glucose has been demonstrated in pancreatic beta-cells from patients with type 2 diabetes. The cause of this dysfunction has been unknown up until now. A new study from researchers at the Buck Institute shows that in patients with type 2 diabetes the balance between supply and demand of the mitochondrial membrane potential (ΔψM) is altered causing a decrease in the signaling that turns on insulin secretion. The opensource study is published in the journal Endocrinology. The team state that the altered balance makes the beta-cells from the patients with type 2 diabetes perform like an economy car, as opposed to a full-size vehicle. They go on to explain that both cars will do fine on a level freeway, however, the economy car will respond more sluggishly when the gas is pressed and fall behind on an uphill road. An increase in blood sugar is the equivalent to stepping on the gas, the mitochondrial membrane potential is the RPM of the engine, and the response makes for a real-life uphill road. The current study utilized new fluorescence microscopic assays to quantify mitochondrial membrane potential and its response to glucose in pancreatic beta-cells from four normal and three type 2 diabetic organ donors. Observation of individual cells under the microscope allowed simultaneous recording of mitochondrial membrane potential and plasma membrane potential, a mediator of insulin secretion, while the supply or the demand in cellular energy metabolism was altered. The data findings suggest that the failure of pancreatic beta-cells to secrete sufficient amounts of insulin in patients with type 2 diabetes may be explained by the cellular level disturbance of energy metabolism, a process whereby multiple supply and demand pathways interplay in a complex network of metabolic reactions. The results showed that mitochondrial energy metabolism did not harbour a substantial defect, and is more a subtle disharmony between bioenergetic supply and demand pathways dampening the response to glucose in the observed individuals. The researchers note that determination of the absolute magnitude of mitochondrial membrane potential that is required for the comparison of diseased and normal individuals has been previously unattainable due to fundamental biophysical processes interfering with the readout of otherwise commonly used fluorescence sensor molecules. They go on to add that the novel assay technology enables researchers to bypass interfering factors and interpret fluorescence signals correctly as millivolt potentials. The team’s technology became practical when it was implemented into Image Analyst MKII, a fluorescence time-lapse microscopy analysis and assay software. This allowed unbiased comparison of mitochondrial membrane potential and its response to experimental interventions in thousands of individual cells in minuscule pancreatic samples from human organ donors. The lab hope that these findings and the newly introduced technology will prompt others to seek a better understanding of the systems-level regulation of cellular energy metabolism. They go on to concluded that, utimately, their goal is to help reveal etiologies that affect this critical mediator of insulin secretion in human type 2 diabetes. The illustration shows individual pancreatic beta-cells from a patient with type 2 diabetes and a patient without the disease. 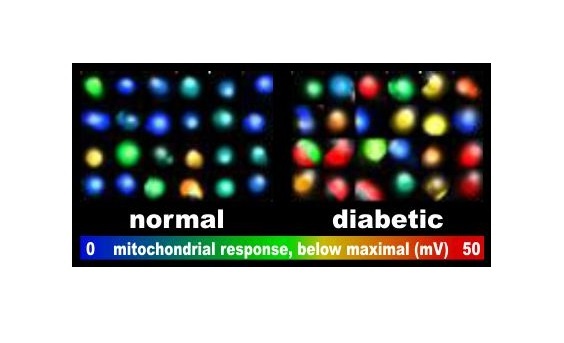 Cells were visualized by artificially coloring their fluorescence image according to the deficit in the response of their mitochondria to glucose. Warmer colors show a larger deficit, indicating how much more response is possible when intracellular energy demand is experimentally shut off. Beta-cells from each of the observed type 2 diabetic donors underperformed beta-cells from normal donors in this respect. Interestingly, the maximal possible response in the absence of intracellular energy demand was not impaired, demonstrating that the mitochondrial polarization and downstream insulin secretion is determined by the supply-demand balance of the intracellular energetics in whole. Credit: Akos Gerencser, Ph.D.